Just as we have our stories, we also have our endings. Many times we expect certain outcomes before they’ve even happened. Or we may react the same way to the same situation every time, and then be upset with ourselves in the same way for doing so. Our beliefs and actions can sometimes be so ingrained in us that we operate without recognizing that we have other options; it never occurs to us that there could be a different outcome to the same story, or better yet, a free fall – a complete surrender to what is real and true for you in that moment. Say, for example, that every time you get together with certain individuals, you overeat and then you come home at the end of the evening and binge. This social scene isn’t really a “fit” for you, you feel inadequate, or are being triggered in some other way. As you sit there with these people, all you can really think about is what you are going to be eating once you step foot inside your house. And when you do finally come home, you go into autopilot and the night ends up with you feeling even worse about yourself….again. Or, let’s say you go out and treat yourself to a massage or a yoga class, but rather than coming home and feeling good in your body and tucking yourself into bed, you come home and have a binge instead. This is because your story doesn’t involve you allowing yourself to feel good – this ending never even occurred to you. The only ending you know is the one that keeps confirming your story (i.e., “I’m fat,” “I have X eating disorder,” “I’m in some way not okay”). What if we turned our stories into our very own “Choose Your Own Adventure” and we tried to visualize a different outcome to the usual way our predictable stories play themselves out? What if we went down a different path, and experienced a different outcome/reality? With the above example, for instance, I might think about what a nice night at home after a massage might look like. It might involve curling up with a book and a cup of tea. Or a hot bath. Or maybe just hopping straight into bed, snuggling up under the covers. Can you picture it? We can’t always change our outcomes over night, but we can began to consider the possibility that we can live it out a different way. Even just this simple exercise of visualizing ourselves responding differently can plant a seed of what is possible for you and challenge your beliefs and behaviours around your current experiences. Give it a go and see what kinds of amazing conclusions you can fathom. 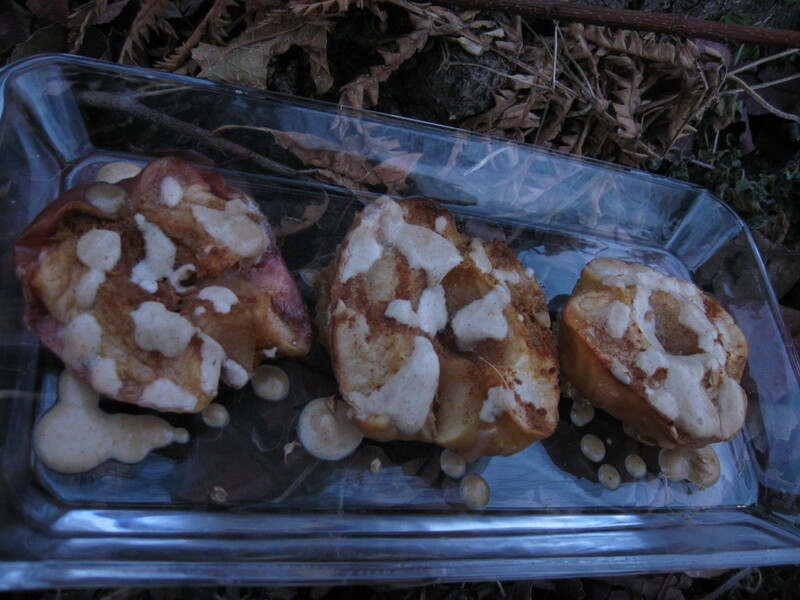 Baked Apples – who knew?? I have been baking apples straight for the last week. I love apple pies, crisps, crumbles – but after baking apples and letting the apples stand on their own, all that doe, sugar, and Earth Balance just seems unnecessary. Something happens in that baking process: some might call it “caramelization,” but I call it magic. The apples turn super sweet, which makes them not only a delicious dessert, but a fantastic sweetener to blend into puddings, spreads, and baking (also great for rounding out texture too!). Here’s one way I’ve been enjoying my baked apples lately, but there are many more which I hope to post about soon. By the way, pears are just as amazing! Preheat oven to 350 F while you prepare the apples, sprinkling evenly with the cinnamon and ginger. Place cut side up on parchment or a silicone baking sheet (for easy clean-up) and bake for 45 minutes or until apples start to ooze sugary goodness. Top with cinnamon cashew cream (see below), almond butter, or eat as they are! Blend together and try not to drink it out of the blender before it makes its way onto your apples. This is also amazing on toast, pumpkin pie, waffles (i.e., gingerbread waffles, need I say more! ), you get the idea.